Is this what redemption looks like? The final individual event in the competition did not disappoint. As expected Carien Kleibeuker, the marathon skater from the Netherlands set a fantastic time of 6:55 right after the halfway mark, then Olga Graf the bronze medallist from the 3k went out hard, and at a pace that looked like it might slip into the lead, but she wasn’t able to finish strongly enough, and she fell just short of the time in the finishing straight. In the very next pair Martina Sablikova and Ireen Wüst duked it out in a rematch of the world single distance championships (and the 3k). The very different approaches to racing made it an interesting pair to watch as Wüst went out hard and even passed Sablikova over the top early in the race, but at around the 3k mark, Wüst began to slow, and Sablikova kept to her schedule and showed her class by holding very flat splits and eventually re-passing Wüst over the top to smash the track record and post a seemingly unbeatable time. Wüst made it to the line just inside of Kleibeuker’s time, and also just under the old track record, set by Sablikova at last year’s world championships. The final pair started well, but neither Pechstein nor Nauta were able to challenge Sablikova and slowly slipped further and further back to finish 5th and 6th, leaving Sablikova atop the podium, then Wüst, then Kleibeuker. All of a sudden, we have a racing format where teams of three skaters have to work together(!) To add insult to injury, at the Olympics they don’t even work together to get the best possible time, but instead have to beat the other team, who races at the same time, but on the opposite side of the track. If there is a greater departure from the essential traditional essence of long track skating, then I haven’t heard it. But here it is, and it’s worth a medal! I love it. It’s exciting, it’s fast, it requires teamwork, and it tests skaters in ways that they aren’t used to being tested. Not surprisingly, this has presented the greatest challenges to long-established skating powers such as the Netherlands (who have two bronze medals) and Norway (who have none). It is not because these countries lack good skaters, far from it (as is evident in the medal count). It is because their programs have so much momentum and are so large and fixed in their (admittedly, often successful) ways, that changing direction slightly to adapt to new challenges is difficult. One of the more challenging aspects of the Olympic team pursuit is the knockout style of competition. The times don’t matter at all, only whether you can beat the team you’ve been paired with, and a team would be expected to win three races in order to win the gold medal. This is a huge departure from the pervasive mentality of long track which is to prepare in such a way as to be able to put in a single brilliant performance without any consideration for what anyone else is doing. Because of this, teams which have come into the games which have, on paper at least, seemed unbeatable have come up short. World record holders, the Canadian ladies team were eliminated early and didn’t even get a medal. The Dutch ladies team, who have often held the world record, have never even won a medal in the short history of the event (it was introduced in 2006). Right now, the Dutch look unbeatable, having all the necessary depth to put together an amazing team, but a team is more than just a collection of individual skaters, and I’m not tipping the dutch for either gold medal. Curiously, the distances in the mens and ladies events are very different, with the ladies racing six laps while the men race 8. Because the burden of leading (and having to combat wind resistance) can be spread out over all three skaters, the speeds reached are very fast indeed. The ladies teams need to be able to start with sub 29-second laps and slowly get slower over the six laps and finish maybe just over 30 seconds. The mens teams would be expected to skate 27-second laps in the beginning, again slowing gradually towards the end of the distance. At these speeds, and at this level of competition, the margins are very close and it won’t just be about which team is composed of the fastest skaters (otherwise we could just give the Dutch their medals and go home) but which team can also execute their plan while making the fewest mistakes. For the greatest aerodynamic efficiency, skaters have to try and skate as close to each other as possible. Anyone who has watched a lot of track cycling at the summer games will be familiar with the general idea. 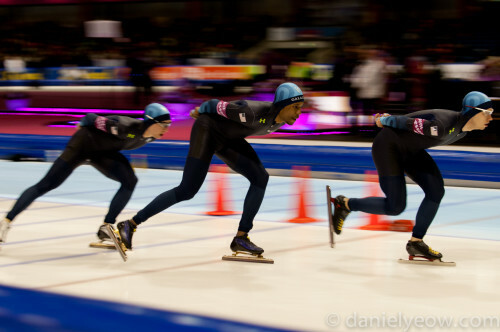 In skating, a small advantage can also be had if the skaters stay in step with each other, also for aerodynamic reasons. The changing of the lead skater needs to be done quickly (since during this time, the frontal area of the team is effectively doubled), with as little disruption to the team’s rhythm, and with as little effort as possible. Of course, this all sounds easy until you consider that they’re doing this while skating at or near their physical limit, gliding along a sheet of ice, on a blade one millimetre thin at over 50km/h. Many things can go wrong. Obviously a fall is disastrous, and they do happen. You’re skating at a high speed in close proximity to other skaters, and the very slightest disruption to your movement – maybe the back of someone’s skate just lightly taps someone’s glove during the recovery of the stroke – can result in a skater being slightly off-balance and falling. But even much smaller mistakes can result in significantly lost time. A poor lead change (watch for those) can leave a team out of sync for some amount of time, during which they will not be travelling optimally. Poor communication within the team can also result in one skater being accidentally dropped off the back, and I don’t have to tell you why that is very bad for the team’s overall time (since the time is taken from the third skater to cross the line). It’s difficult to pick a winner when you’ve decided that you don’t want to pick the Dutch. In the junior ranks, the asian countries perform very well, but this promise inexplicably evapourates when they grow up. For the girls, you have to look at performance in the 1500m to have a good idea of how they’ll go. The Dutch 1-2-3-4 finish is a bit too much to overlook, but I’m going to go against the grain, and put them down for a bronze. Since there were four Russians within the top 10, I’m going to pick them for the win. Ordinarily the Germans would also be a shoe-in but they unfortunately didn’t qualify for this games, so I’m going to go with my heart and choose the Americans for the silver. They’ve copped a lot of unfair criticism, and even though they’re one of the more lowly-ranked teams, their team is made up of inliners and if there’s anything that inliners are good at, it’s skating in a pack and working as a team, and that might be just enough to give them an edge over the more highly-ranked teams like Poland and Korea. For the guys, with the Dutch 5k sweep in mind, it is also difficult to overlook them. Another factor is that for once there is a good chance that all of the team will have actually spent a decent amount of time skating with each other (previously, they just threw together three fast guys, often from different commercial teams, and often who didn’t know how to skate together). Also if they go with Jan Blokhuijsen and Koen Verweij, they’ll have two experienced inline skaters who between them will be able to keep things together, and both of them hungry for the gold after their silver medal performances in the 5k and 1500m respectively. But no, I’m going to put them down for the bronze (sorry Jan and Koen if you’re reading this, you know I love you both). There’s Russia, who are host country and will have the crowd on their side, and who also rested Ivan Skobrev from the 10k so that he would be better prepared for the pursuit. Norway, for similar reasons (they pulled BOTH of their skaters out of the 10k) will be ones to watch as well, since they are fresh, extremely talented, and will be motivated after an apparent underperformance in previous events. An outside chance for an upset are team USA, absolutely sick to death of the suits controversy, and now with Shani Davis on the team, and historically whenever he’s been on the team, they’ve done very well. Don’t forget to click on the sochi2104 tag below to read other articles about these olympics. You may also want to read the ‘Sochi Specials’ some of which have been very popular, the close finish of the mens 1500m has raised questions about the timing equipment used in speed skating, while the controversy surrounding the American’s suits might lead you to read about the speed suits in general terms, or more specifically in an article where I articulate why it is NOT about the suits. Going even further, I break down and analyse the anatomy of a race, using American skating legend Shani Davis as an example. There was also a short article added today about why speed skaters don’t tear up the ice in the same way that hockey skaters do.